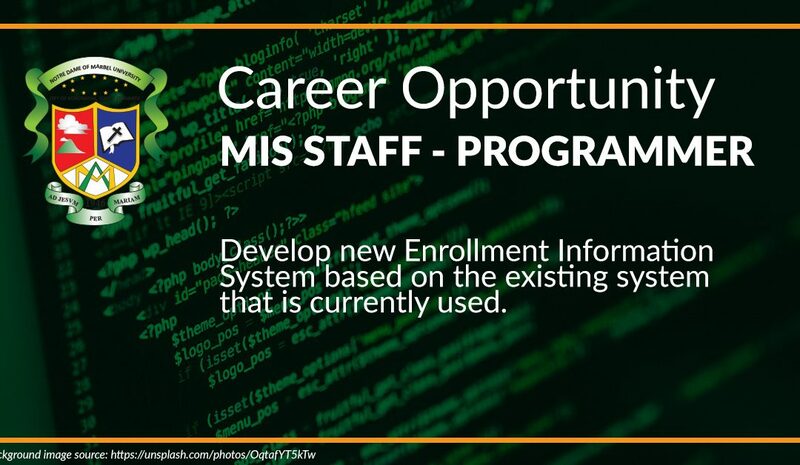 Develops new Enrollment Information System based on the existing system that is currently used. Develops a new Enrolment Information System that will cater all the transactions from enrolment down billing and grading of students. Corrects errors by making appropriate changes and then rechecking the program to ensure that the desired results are produced. Conducts trial runs of programs and software applications to be sure they will produce the desired information and that the instructions are correct. Writes, updates, and maintains computer programs or software packages to handle specific jobs, such as tracking inventory, storing or retrieving data, or controlling other equipment. Writes, analyzes, reviews, and rewrites programs, using workflow chart and diagram, and applying knowledge of computer capabilities, subject matter, and symbolic logic. Consults end users to clarify program intent, identify problems, and suggest changes. Preferably a graduate of Information Technology, Computer Science or any computer related courses. At least 2 years of working experience related to software development. Must have a strong background in web and mobile application development.